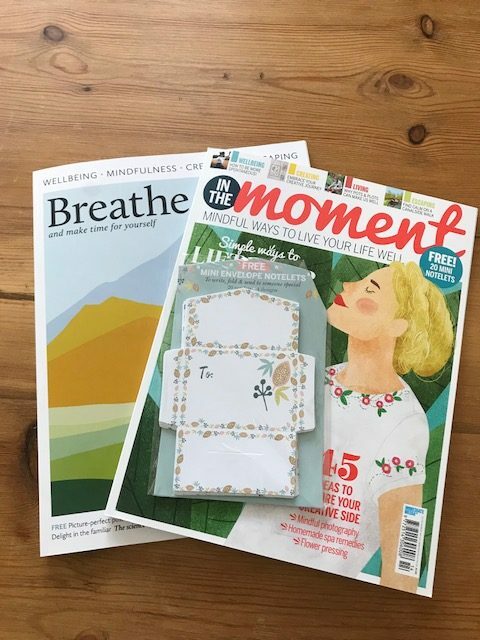 Mindfulness & Wellbeing Magazines…A Review.. Visiting the supermarket this week I noticed on the stand two new magazines aimed at Mindfulness and Wellbeing and thought I would buy them to see what they were like. At £5.99 each they were quiet an investment. Maybe I am a little out of touch with magazine costs but they were certainly ones that would not end up in the recycling at that price. So grabbing a coffee and a much needed break I sat down with the first one called In The Moment Mindful Ways To Live Your Life Well. The front cover is beautiful illustrated and very eye catching along with a free gift of some mini envelope notelets. 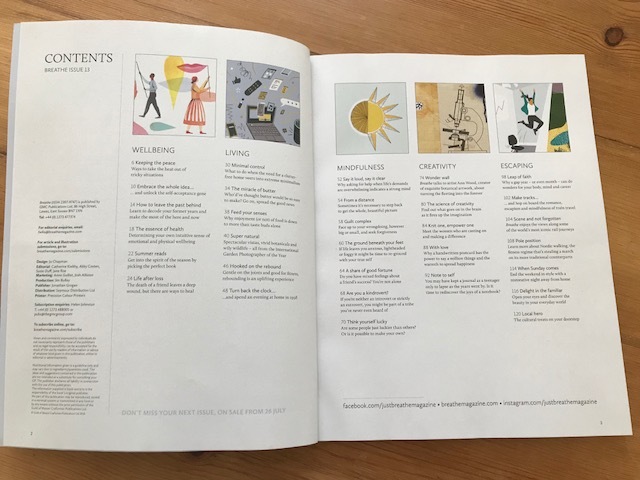 It is full of articles on wellbeing, being creative, lifestyle and finding calm in various ways which are very informative and easy to read and understand. It’s such a shame that it is clearly aimed at women. Men do get a rough deal when it comes to Mindfulness and their mental health, and in no way should it be seen as something for women only. I hope they will address this. The second magazine is called Breathe and make time for yourself . I loved the cover! it would make a lovely coffee table magazine that at first glance looks like it is aimed at everyone. Sadly there is also no content for men which is such a shame! I truly hope that one day a publishing house can produce something aimed at all. I guess it’s a sad fact that maybe it is women who are the ones that buy magazines and I hope that a partner somewhere might also pick it up and have a read. Mindfulness and Wellbeing is at the heart of all that we do at MindfulnessUK. It’s about every aspect of our lives that all play a part in making us well, happy and contented both mentally and physically. To encompass all these aspects of wellness in one magazine is a great idea. It will give readers the chance to look at every part of their lives to see where they can make improvements to aid their wellness, which is a fantastic idea. At £5.99 each would I buy it every month or just pick one up when I was shopping? Actually I think if money was no object I would buy them. If you are looking for inspiration then the articles are a great read and very informative. They would make a great gift for someone who is in need of a lift. 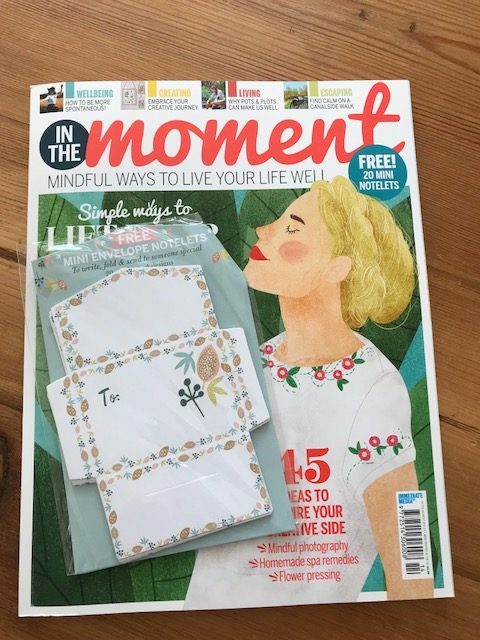 If you are new to Mindfulness and want to learn more then I am not sure that these magazines will give you the background and skills to do the meditation practises and the knowledge and ethos of living in the present moment. Mindfulness is a skill to learn and takes PRACTISE so we would always suggest you take an 8 week Mindfulness course that will set you on your way.